A 102-year-old man tries to break the record for the oldest person in the world. 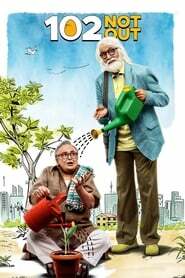 102 Not Out is a 2018 comedy-drama film, with legendary actor Amitabh Bachchan playing a 102-year-old wanting to break the oldest-man-alive record. Another Bollywood legend Rishi Kapoor plays his sad and grumpy 75-year-old son.